Cripes! That looks godawful. Here, have another look. DeShields was playing for Houston's Double-A squad from Corpus Christi when he was hit in the face and, amazingly, walked off under his own power. 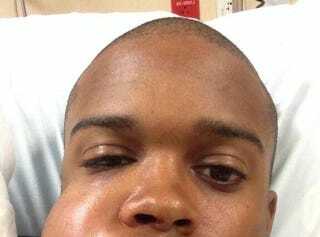 According to Astros GM Jeff Luhnow, DeShields was diagnosed with a non-displaced maxillary sinus fracture. He is scheduled to be further evaluated today.